FILE - Members of the Islamic State in Khorasan province group post a flag in a tribal region of Afghanistan, Nov. 2, 2015. The deputy chief of the group has joined the Taliban, a spokesperson for the Afghan Taliban contends. The Afghan Taliban on Thursday claimed that the deputy head of the Islamic State terrorist group in Afghanistan had joined Taliban ranks. Qari Yousef Ahmadi, a Taliban spokesperson, said in a statement sent to media that Abdulrazaq Mehdi, deputy chief of the so-called Islamic State in Khorasan province (IS-K) in Afghanistan, had parted ways with IS and joined the Taliban. The Taliban spokesperson also shared a recording of a taped interview with Mehdi in which he denounces IS's "cruel" acts in Afghanistan and calls the group an "anti-Islam and -Muslims" organization. VOA was unable to independently verify the authenticity of the Taliban claim or the recording. The Taliban statement said Mehid is a resident of western Farah province, but little is known about him because IS leaders use aliases. Wahid Muzhda, a Taliban expert in Kabul, told VOA that it was unclear whether Mehdi was indeed an Afghan national. He added that the Taliban might want to "use him as propaganda to discredit IS." The Taliban statement came amid a growing rivalry between the Taliban and IS in Afghanistan. IS and Taliban militants have frequently clashed for control of districts and villages in eastern Nangarhar and northern Jouzjan provinces, where some local militants and foreign fighters associated with the Islamic Movement of Uzbekistan (IMU) — which has previously associated with al-Qaida and the Taliban in Afghanistan — recently joined Islamic State. Fresh fighting between the two warring parties has displaced hundreds of families in Nangarhar's Khogyani district. Several civilians who were caught in the crossfire during recent clashes have been killed. Besides battling with Taliban militants, IS fighters have repeatedly targeted Afghan villages and civilians. The group has destroyed homes, torched markets and barred children from attending school in areas under its control. The IS Khorasan branch has also claimed responsibility for numerous deadly attacks in major Afghan cities, including attacks on mosques in the capital, Kabul. IS's Khorasan province was formed by Hafiz Saeed Khan, a former Pakistani Taliban commander in the southern districts of Nangarhar. Khan appeared in a video in January 2015, along with 10 militant commanders — each representing a subregion within the Afghan-Pak region — pledging allegiance to IS. 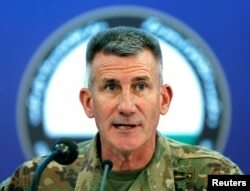 General John Nicholson, commander of U.S. and NATO forces in Afghanistan, said Tuesday that IS's initial plan was to establish a caliphate in Afghanistan. FILE - U.S. Army General John Nicholson, commander of U.S. and NATO forces in Afghanistan, speaks during a news conference in Kabul, Afghanistan, Nov. 20, 2017. "Daesh has been unable to establish a caliphate in Afghanistan. This was their ambition two years ago," Nicholson told reporters at the Pentagon via teleconference from Afghanistan. He used an Arabic acronym for IS. Nicholson said most IS fighters in Afghanistan are former members of the Pakistani Taliban group TTP, many of whom belong to the Orokzai tribe in Pakistan. "These are primarily non-Afghans, some members of Islamic Movement Uzbekistan, and many former members of the Pakistani Tehrik-i-Taliban Pakistan," Nicholson said, adding that there has been no evidence of IS fighters making their way from Syria and Iraq to Afghanistan. He said under the new U.S. policy for Afghanistan and South Asia, American and Afghan forces are increasingly targeting the IS terror group in the country. "Since March, we have conducted about 1,400 ground tactical operations and strikes, removing over 1,600 Daesh from the battlefield and reducing over 600 of their structures, facilities, fighting positions, et cetera," he said. The general added that the Afghan people have rejected the IS ideology and its presence. "They [IS] are totally repugnant to the culture of Afghanistan. The majority of these fighters are non-Afghans. They are Pakistanis, they are Uzbeks, and they are others," Nicholson said. "Their brutality, their cruelty is totally against Afghan culture. They are rejected by the majority of Afghans. So we are seeing a minority of the fighters in Daesh are actually Afghans."